MY BABY GIRL TURNED SIXTEEN!! And because 16 is kind of a big deal, we had decided to take a few of her friends to The Chocolate Bar in addition to the usual sleepover. Cody ended up getting sick the night before the sleepover, which was horrible for him and for the sleepover situation. I didn't know what to do, because I didn't want it to ruin Elly's birthday. But I certainly didn't want any of her friends to end up with a stomach bug (& I'm sure her friends and their parents wouldn't want it, either)! Christopher had the great idea for us girls to stay the night in hotel, and Elly's birthday turned out to be a way better celebration than we had originally planned! 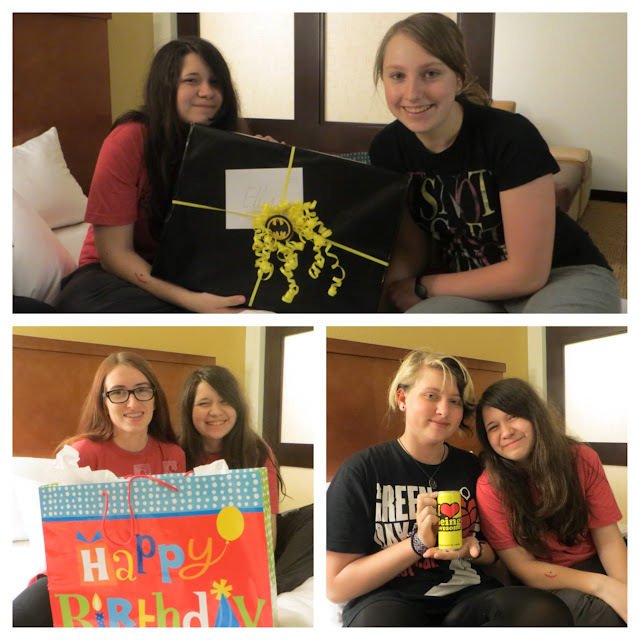 When we got to the hotel, Elly opened her presents! ...and 16 presents from us! Most items were random little favorite things of hers like beef jerky, Sour Patch Kids, Duck tape, socks, and a coffee mug. We are going with her to pick out a new guitar, and we also gave her the keys to Silvie! For her birthday lunch after church today, we went to The Melting Pot! !